Can anyone please say what is the best format for importing movies into itunes. I have some movies that are .vob files - do they need formatting into some other format first. What video format does iTunes support? This kind of question can be found at a slew of Q&A websites like yahoo answer, discussions apple, support apple and so on. But still many a user can’t get the comprehensive yet satisfactory answer from those sites. In such a case, this article will list out the best video format (also audio format) for iTunes and give you some tips on playing video in iTunes. According to Apple, iTunes supports any video format that works with QuickTime and files purchased or downloaded from iTunes store. MP4 (A digital multimedia format most commonly used to store video and audio, subtitles and still images.) is actually a standard that Apple really pushed with iTunes. So, generally speaking, you can play .mp4 format movie in iTunes. Attention shall be paid .mp4 video has its codec limitations that .mp4 video encoded as 540 kbit/s with H.264 and an approximately 128 kbit/s AAC audio track is regarded as the best video format for iTunes. And, .mp4 video encoded with other codec and sample rate will meet waterloo but nothing in iTunes. MOV (A filename extension for the QuickTime multimedia file format) uses a proprietary compression algorithm developed by Apple Computer, which is the standard and best video format for QuickTime. It is well-known with its unbeatable high quality so that it’s warmly-received by masses of iTunes users. M4V (A video container format developed by Apple and is very similar to the MP4 format.) is widely utilized to encode video files, such as TV episodes, movies, and music videos, in iTunes Store. In general, the copyright of M4V files may be protected by using Apple's FairPlay DRM copy protection. 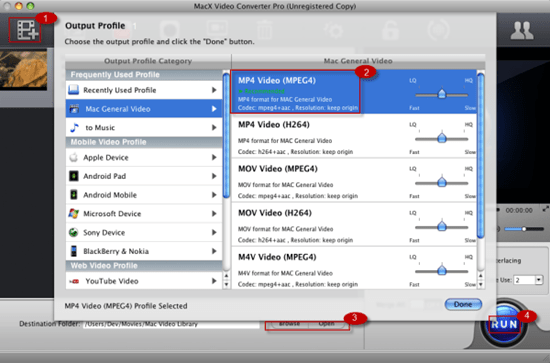 Tips: To Unlock protection protection from iTunes M4V videos, you can resort to the powerful video converter for Mac. Part 1: How to Play Other Video Format in iTunes? Supposed you have stored certain videos with other video formats like AVCHD, MTS, MKV, AVI, FLV, WMV, etc. and long to play these videos in iTunes, what could you do? Well, the simplest way is to convert these videos to iTunes supported video formats. To achieve this goal, a professional yet easy-to-use video converter is essential. You can put stock in MacX Video Converter Pro, which can convert almost any video to best video format for iTunes playing with the greatest quality. Warm Prompt: For those who eager to put purchased iTunes video to non-Apple devices like Samsung Galaxy S9, HTC 10, Sony Xperia Z5, PSP, Xbox One, Surface Pro for playback, MacX Video Converter Pro can also address your needs like a cork. And this fabulous video converter can also aid you to download and convert YouTube video on Mac, so that you can also play converted YouTube video in your iTunes or other portable devices at your will. 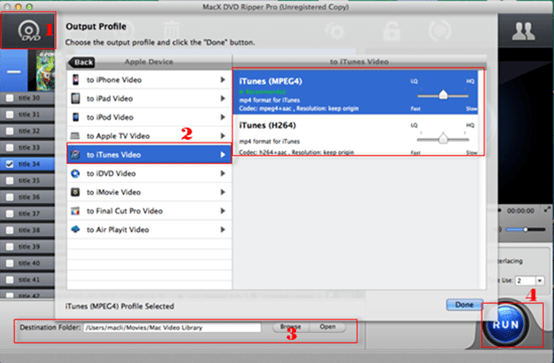 Part 2: How to Play DVD Video on iTunes? Dozens of iTunes users asked online that how to play DVDVOB files in iTunes. 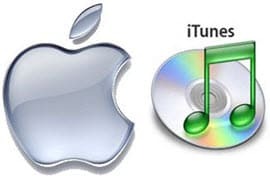 As is well-known, iTunes doesn't accept any DVD video format, so you are required to seek help from an effective yet versatile DVD ripper to rip and convert DVD to iTunes video file format like MP4. Here MacX DVD Ripper Pro is the compelling choice, which enables to rip any DVD to iTunes supported MP4, MOV and M4V just in a few mins. Tip: Aside from capable for ripping and converting DVD to best video format for iTunes, this stellar DVD ripper for Mac can also rip copy protected commercial DVD for your legal personal use. No matter the DVD encrypted by the latest Disney New DRM tech, or the common Sony ARccOS, Region Code, CSS, it's able to parry these copy protection techs in a breeze while preserving original high quality.